Fun and something to enjoy! Your relationship with food feels like a rollercoaster ride. You tend to fluctuate from being overly controlling with your diet to overindulging. You tend to skip meals (especially breakfast) and eat small lunches with no snacks to limit calories. By the end of the day, however, you’re hungry and tend to overeat or indulge in the wrong things. When these bouts of overeating or poor choices happen, you feel guilty the next day and skip and cut down on meals even more to try and make up for it, only to start the pattern over again. Your goal is to stop being so controlling about food AND so lax in other moments. By skipping meals or not getting enough to eat during the day, you are setting yourself up to fail. Be sure to eat three proper meals every day, and spread your intake of calories evenly throughout the day. Healthy snacks (a piece of fruit or carrot sticks with hummus) can help you feel satisfied throughout the day and prevent you from overeating in the evening. Remember, eating isn’t an all-or-nothing scenario. Don’t think about whether you’re on or off a diet. Focus on developing a healthy eating style for life! When you feel emotional discomfort, you tend to cope with food. When you feel good, you can control your eating and make healthy choices. But when you feel stressed, angry or sad, you tend to splurge to feel better. This coping mechanism usually makes you feel better in the short-term but later makes you feel guilty, which leads to more emotional distress — an unhealthy cycle. Identify alternative ways to cope with stress. Choose things you enjoy and that don’t involve food. The best stress-busting habits for you are ones that are difficult to do while eating. Try yoga, a walk or even a hot bubble bath. When you turn to food, ask yourself, ‘Am I really hungry? Or am I just eating to try and feel better?’ If you are upset, ask yourself if you might feel better in the long run if you choose a non-food stress reliever. Try calling a friend! 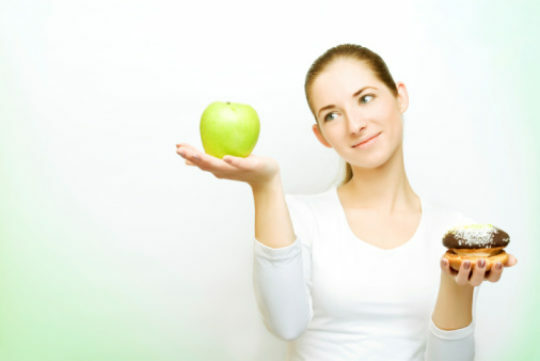 You tend to choose the right kinds of foods but have a hard time eating a healthy portion. Your weakness is eating too much in one sitting. You may not recognize that you’re eating as much as you are. But today’s bagel with cream cheese and a tall glass of OJ packs 700 calories, while a dinner of “healthy” choices such as a Chef’s salad, pasta with chicken and parmesan cheese, a whole wheat roll and a cup of frozen yogurt adds up to a whopping 850 calories! Read labels and educate yourself on how many calories and fat grams you should be consuming per day — the average woman should consume 1,800 calories and 60 grams of fat; the average man, 2,400 calories and 80 grams of fat. Try using a smaller plate and slowing down to eat more mindfully. Wait a half an hour before going back for seconds. Popular 100-calorie snack packs are a great way to understand the size of a proportioned snack. And diet frozen entrees are a good choice for establishing a meal size. You tend to eat fast and on the run. You don’t have time to plan meals and tend to eat too much fast food and pre-packaged, processed foods, which sneak in extra calories and fat. You find yourself going through the drive-through a lot, reheating frozen foods and snacking on vending-machine offerings such as chips or cookies. Plan ahead. If you know you aren’t going to have a lot of time to eat during the day, pack meals and snacks the night before. Try trail mix, fruit, or broccoli and cherry tomatoes with a low-fat ranch dip. Meal replacement bars are a better choice than what’s offered at most fast-food stores or in vending machines. Use the weekends to plan dinners. Grill several chicken breasts on a Sunday to use during the week as salad toppers or sandwich fixings. Bonus: You’ll save money! Congratulations! You tend to eat well and have a healthy attitude toward food. You understand the importance of practicing moderation. You may not be perfect — and, in fact, you shouldn’t be! A little “unhealthy” indulgence every now and again can keep you from overindulging regularly. When you do make healthy food choices, which should be 80 percent of the time or more, you choose a good mix of proteins, carbohydrates and low-fat or good-fat foods. You choose whole grains, eat three meals a day plus healthy snacks when needed, tend to exercise regularly and don’t skip meals. Keep doing what you’re doing, and remember that moderation is best. If you are worried about any unhealthy eating habits you may not be aware you have, try keeping a food journal for a week or two. You’ll see if there are areas where you can improve!